Binding Pros Website - SEO That Works! Binding Pros Website – SEO That Works! 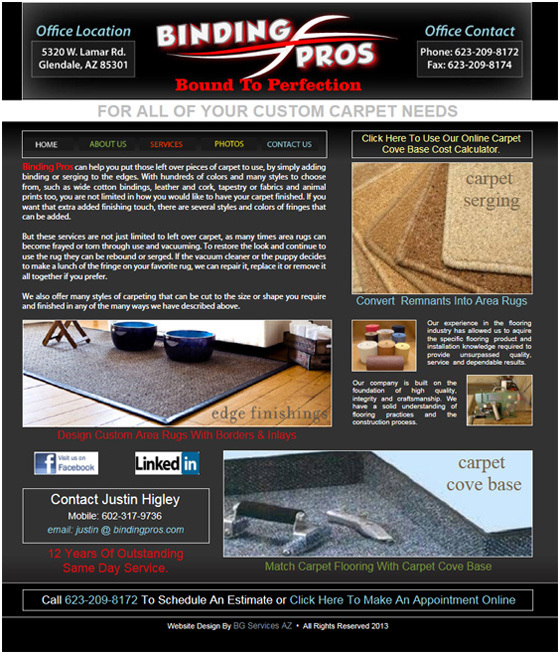 Long time BG Services AZ client, Binding Pros in Glendale, AZ, remains at the head of the page in the top 10 Google Search Terms for the Phoenix Metro market. Binding Pros subscribes to our Enhanced SEO Service which uses Organic Search Engine Optimization. This is a process we use to obtain a natural placement on organic search engine results pages. We use keywords, keyword analysis, meta descriptions, backlinking and link building to improve site popularity. We write content that is relevant for human readers. Unlike many other website developers, BG Services AZ takes the time to analyze your site statistics, compare your results with the top search terms for your business, modify page content and site tags to help put, and keep, your website high in the rankings. Contact BG Services AZ Today To Learn More About Our Services.